'Why didn't we save ourselves when we had the chance?' 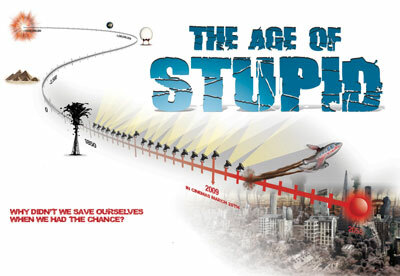 This is the question Age of Stupid, a 90-minute film on climate change, tries to answer - from the perspective of man in 2055. Part drama, part documentary, part animation this movie focuses on climate change and it's influencing forces - oil, war, politics, consumerism and ‘human stupidity'. Oscar nominated Pete Postlethwaite (think In The Name of the Father, Jurassic Park and Brassed Off) stars as the only actor in this piece but is joined by seven real-life people from across the globe who are already feeling the consequences of our changing climate. From an 82-year old French mountain guide to a windfarm developer fighting the anti windfarm lobby in England to a woman living in Shell's most profitable oil region in Nigeria, we hear their stories. Filmed in Iraq, India, Jordan, The Alps, America, Nigeria and the UK The Age of Stupid was funded by selling shares to individuals and groups interested in making such a film thereby being completely independent. Quite a momentous task... and it took four years to make! Director Franny Armstrong (think McLibel) has made a thought provoking and hopefully widely persuasive film. The reviews so far say it all really: ‘Knocks spots off an inconvenient truth' The Ecologist, and ‘The first successful dramatisation of climate change to hit the big screen' The Guardian. See the trailer below or visit the film's website for screenings.